The water towers that once graced Crystal Palace Park more than 170 years ago could be rebuilt under plans being drafted by designers. The new structures would act as wind turbines, generating electricity for the 200 acre south London site. The London Development Agency is expected to present their master plans for the entire site to Bromley Council in October. The £100m development of Crystal Palace Park is expected to take 15 years. "This could potentially be a beacon for London," said designer Robin Buckle. "It would be illuminated at night and provide a magnificent landmark on the broader London skyline and really put Crystal Palace on the map." The original water towers were designed by the engineer Isambard Kingdom Brunel in 1855 to feed the fountains below and could hold up to 1,200 tons of water. They drew in so much water that they were only operational a few times of the year and they eventually became redundant in the 1870s as they constantly broke down. 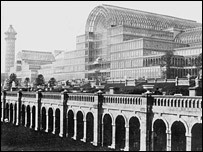 The structures were partly damaged by the famous fire of 1936 which destroyed most of Crystal Palace. They were finally demolished in WWII to stop enemy bomber aeroplanes nagivating their way to London. The new towers could generate about 20% renewable electricity - above the mayor's 10% for new developments.